Happy Days: For Seneca multi-millionaire President Barry Snyder (center). He saved $200 million and got a ten-year extension on a compact which allows his Nation to enjoy a superb economic superiority over Americans in Niagara Falls. It is not clear what the other two men who gave away our rights, Mayor Paul Dyster (left) and Gov. 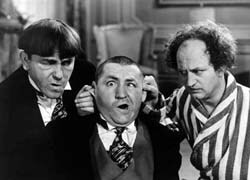 Andrew Cuomo (right) have to celebrate other than the fact they are gracious losers and happy with bestowing superior legal rights to people they do not govern, over the people they do. area allowed to debate it. Unmentioned in all the ballyhoo surrounding Gov. 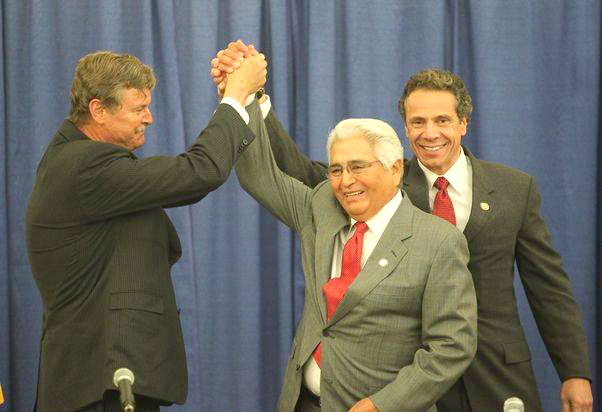 Andrew Cuomo’s visit to Niagara Falls last week to announce an agreement ending the stalemate between the state and the Seneca Nation of Indians was the fact that the agreement extended the life of the compact for an additional 10 years. In practical terms, this means that neither the people of Niagara Falls nor their elected representatives will have an opportunity to comment on whether having the casino here is a good thing or not until 2023, rather than 2016, when the gaming compact was set to expire. For years locals have discussed the negative aspects of the compact. Why does the city receive only 25 percent of the 25 percent of the slot machine revenue paid by the Senecas to Albany, for example? After all, the city bears 100 percent of the cost for police and fire protection, water and sewer lines, road repairs, snow plowing and other services necessary for the casino to stay in operation. Why should Albany get 75 percent of the money and leave Niagara Falls with a measly 25 percent? And why are the Senecas only paying 25 percent of just the slot machine revenue in the first place? Shouldn’t they also be paying a cut of the green games, hotel room income, restaurant revenue, cigarette, jewelry, and clothing sales? Has having the casino downtown helped or hurt local business? Has it improved the quality of life for city residents? How much of the money being kicked back to the city is actually lost at the casino by Niagara Falls residents who might otherwise be spending it at locally-owned taxpaying businesses? Do the Social Security and welfare checks received by a majority of our citizens constitute the bulk of the casino cash funneled through Albany and received at City Hall each year? What are the social costs of plopping down a gambling Mecca in the middle of an economically devastated city where the average income is but $18,000 a year? And how many casino employees actually live in the city? When the casino first opened, Seneca leaders talked about providing housing for their workers in the rundown neighborhoods adjacent to the former convention center. Why haven’t these plans materialized? These are some of the nuts and bolts questions but there are philosophical ones as well. Where is the fairness? Is a decree by the state of New York that favors awarding civil and economic rights to members of one race or ethnicity at the expense of all other races and ethnicities sound policy or tyrannical dictatorship? Why should an Italian, Irish, Chinese, Pakistani or African-American restaurant owner in Niagara Falls be subject to some of the highest taxes anywhere in the United States while their Native American counterparts at the casino pay no taxes at all? And why should the victim of a slip and fall accident inside the casino be forced to seek legal redress in the Seneca Peacemaker Court while the Senecas are permitted to go after deadbeat gamblers and others at the Niagara County Courthouse in Lockport? Many here have been waiting for the compact to expire for the opportunity to ask these questions and more. But those issues were decided – for the next decade at least – by two sets of lawyers in Albany, one representing the state and the other the Senecas. And they decided everything’s hunky dory just the way it is. Who cares what they think in Niagara Falls anyway?